For further background, please also consider perusing The Tyranny of Private Property page if you haven’t already done so. Since political economy is such an expansive topic, we'll need some pretty hefty containers to sort it into digestible bits. In the past I have begun with an overview of Integral Lifework's twelve nourishment dimensions, then expanded out from there. But that doesn't work well for this exercise, and in fact I've been looking for ways to get a handle on political economy for a long time. Thankfully, I stumbled across an article by Carol M. Rose, "Romans, Roads, and Romantic Creators: Traditions of Public Property in the Information Age," that provided an aha moment about how to begin, and that is through a thoughtful categorization of property. Since that beginning, a cascade of insights and correlations have fit neatly into a property matrix that will hopefully allow us to organize property in a still more comprehensive way. So first we'll borrow a few terms from ancient Rome that were used in property law, mix in some layering concepts from Open Systems, add a property valuation strategy, then ferment this concoction within the multidimensional nourishment of Integral Lifework. Res nullius: Something that could be owned, but as of yet is not. Potential property. Res privata: Something that is privately owned. Private property. Res universitatis: Property owned by an exclusive community for that community's benefit. Communal property. Res publica: Property that could be owned (privatized) by anyone, but which is reserved for collective public use. Since this public benefit is usually enforced by the state, res publica is often associated with state oversight. Public domain property. Res communes: Something tangible that cannot be exclusively owned by anyone, mainly because of its boundaryless nature. For example, the air, or the oceans. Common property. Res divini juris: Something tangible that could be owned, but should not be owned because it is considered sacred. Sacred property. Physical layer: Tangible forms of property that are usually immovable and inert. For example: land, buildings. Data Link layer: Tangible forms of property that are usually immovable, and which often facilitate the conveyance of other tangible property. For example: roads, bridges, pipelines. Network layer: Tangible forms of property that are movable (even if temporarily immovable), and which may, by there nature, be able to contain and convey different layers of property. For example: vehicles, recording devices, communication and electrical lines, broadcast and relay antennas, computers, human beings, plants and animals, other living organisms. Transport layer: Property existing on the cusp between tangible and intangible, and which often acts as a conveyance medium for higher layer intangible property. For example: electricity, the electromagnetic spectrum, sound waves, psychoactive chemicals, the atmosphere. Session layer: Slightly more abstract intangible property that tends to be the nexus where all other layers intersect. For example: all creations of the mind, from fine art and inventions to philosophy and religion. Presentation layer: One more layer of abstraction and sophistication for intangible property, which tends to be intimately involved in creating lower property layers, and/or providing a context for the application layer to interact with those lower layers. For example: language, intelligence (human, animal or artificial), perception. 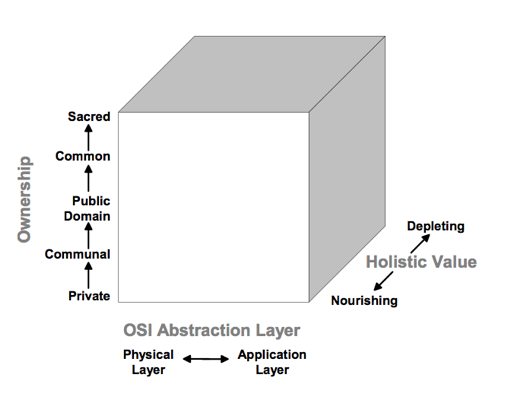 Application layer: The most abstract and intangible forms of property, so far removed from the material world that their existence may be challenged and their contribution questioned, but which nevertheless seem both dependent on, and able to create, lower layers of property. For example: Ideas, feelings, memes...and perhaps karma, spirit and soul. What is happening here? From one angle, we could say that this is simply a changing scope of property function. But from another, what we are really observing is the complexification and abstraction of property itself. This evolution appears to be one of the consequences of advancing human civilization and expanding consciousness, and there is a suggestion that as we have progressed through the industrial and information revolutions, the tendency has been for larger and larger swaths of property to function in the more abstract OSI layers. However, these layers are strictly and hierarchically dependent, for without the physical layer there could be no network layer, without the network layer there could be no transport layer, and so on. And dependences travel in the opposite direction as well, for the application layer leads to the ongoing creation of the presentation layer, and the presentation layer leads to the creation of the session layer. In many ways, this abstraction and complexification of property has made it increasingly challenging to assign property via the classic Roman ownership categories. That hasn't discouraged attempts to do so, via our legal system and emerging social mores, but a lot of cultural tension seems to be generated around the speed with which property within more abstract layers is being created and exchanged, regardless of the prevailing political economy. However, this still isn't a sufficiently well-rounded method of valuation. I would like to add one more factor, and that is how skillfully property contributes to effective, balanced nourishment. What I mean by "effective, balanced nourishment" will become clear when we discuss the twelve nourishment centers later on, but what I am really trying to do here is add a vast, usually hidden repository of externalities to the calculation. For example, if water is polluted with toxins and carcinogens, then its use value is greatly reduced. This is not because someone who consumes the water knows anything about these toxins and carcinogens, it is instead a measurement of the additional costs required to offset these health dangers, either through treating people who get sick, treating the water so it becomes safe, or correcting the industrial practices that led to the pollution in the first place. When we combine such externalities with intersubjective use value calculations, we realize that any property that invites a widespread expectation of safe nourishment (such as water, food, air, etc.) has very high holistic value. So we see that quality supersedes quantity in such calculations; it does not matter if water is abundant, if that water is not safely consumable. In this way we redefine scarcity, because within holistic value, scarce quantity is equivalent to scarce (or difficult) quality. There are of course instances in which we find an inverse relationship between "value" as defined in this way and either its perceived use value, or its actual exchange value in a given economy. This is what we might call perverse utility. An obvious example would be highly addictive, ultimately lethal drugs and drug delivery systems. If we used only one use factor, such as subjective desirability, we might arrive at a high perceived use value, and often a correspondingly high exchange value. But when we add effective and balanced nourishment to the equation, our new method of valuation quickly pushes something like cigarettes into the negative. At the opposite extreme, fast food with a low exchange value may nevertheless hold a high perceived use value, especially for people with little time to eat or a strong predilection for sugar, salt and fat. But if this food isn't nutritious, and in fact leads to many illnesses and premature death, then by any standard of effective, balanced nourishment this food ends up having a lower holistic value. Thus esteemed, desired and dependent utility must be balanced against property's contribution to nourishment, so that by understanding these complex relationships we can estimate a more practical valuation of all property. Exactly why a more well-rounded valuation is important will become obvious by the end of this book. Taking these three axes together, we have the vertical axis of ownership, the horizontal axis of abstraction, and the depth axis of holistic value. With these we can plot the position of property in any context in a three-dimensional way. The evaluation of property position within this matrix has nifty utility in any discussion where politics, culture and economics intersect, so we'll be relying on it both to elaborate on existing institutions and systems, and to describe potential departures from the status quo. In our case, the notion of "property" will expand even into aspects of the political process itself; in fact we may need to stretch the metaphor to its limits. As for the concept of personal property, that will for the most part be excluded from this discussion, though its existence is both assumed and implied throughout as an inherent extension of personal freedom. When viewing political economies through the property matrix lens, what quickly becomes evident is that nearly all of them insist on controlling property through its position in the matrix. For example, even among anarchist ideals that reject authoritarian controls, property position is one of the persisting agreements without which anarchism could not function as proposed. How property position is enforced may vary among different anarchist proposals, and the institutions of enforcement may be more decentralized, but the fact is that some sort of force must of necessity be used to extend primary assumptions and preferences about property into a functional system, as well as to maintain that system over time. So regardless of what approach we take, and no matter how egalitarian or democratic our economic and political systems are, the mechanism of property position enforcement becomes central to its practicality and durability. Even if we advocate that all property should remain common, or that we should emphasize and celebrate property with a high holistic value, this assignment must persist in collective agreement, or it is just a fairy tale. So, once again, we arrive at that critical distinction between collective responsibility and individual freedom, for there will always be divergent opinions about where property should be located within the property matrix, either as the main focus of collective production or consumption, or as a privilege of individual accessibility or ownership. Where the previous descriptions of advancing moral sophistication were about relating self-to-other, the progression described here concerns the relating of self-to-property. As with self-to-other relationships, self-to-property relationships also become more and more inclusive until dynamic unity is achieved; thus we can perceive a unitive principle for both types of relationship. Is there an empirical means of testing the accuracy of such correlations? There may be, but right now this is mainly a grand hypothesis derived from observations, mystical practices, the writings of philosophers, and the teachings of a broad spectrum of spiritual traditions. Among my observations of relationships (in everything from managing employees to mediating disputes to counseling couples), shared values identification, along with an awareness of different perceptions or perspectives around common experiences, leads to greater empathy, mutual compassion and understanding. The predictable expansion of self-identity to include others (or at least certain aspects of others) in these contexts inherently produces greater information and resource sharing; it is an almost automatic consequence of a reconciliation and interpersonal investment process. In mystical practice - that is, the routine and disciplined activation of mystical perception-cognition - unitive insights and a gradual letting go of egoic selfhood routinely reinforce these same compassionate and generous orientations towards others. And so it should come as no surprise that, among the world's greatest spiritual traditions, the reliable demonstration of spiritual maturity always includes letting go of willful selfishness, a greater commitment to helping others, a collectivizing of resources, and a resolute departure from acquisitive patterns of thought and behavior. The OSI layers of functional abstraction were barely touched upon here, mainly because each function has less to do with moral evolution, and more to do with technological advancement. It seems probable, however, that if technology advances along with morality, the unitive principle will be reflected here as well. 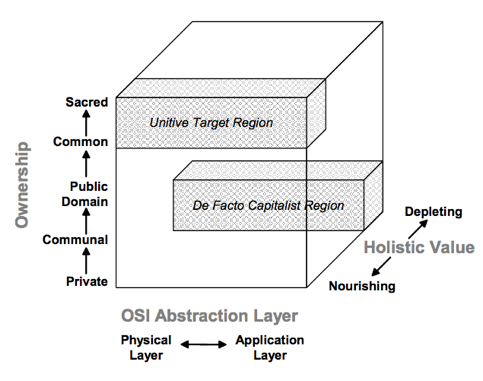 That is, the OSI layers themselves will begin to integrate and merge, until there is less and less differentiation between the most abstract and intangible, and the most tangible and concrete. We can imagine a distant future in which the human mind, body, heart and spirit no longer perceives itself as separate from either Nature or humanly created things; where we are unified with existence, and all of existence is unified with itself, so that we are no longer acting upon that existence, but as part of its energy and flow. Can we apply the unitive principle to political systems and institutions? I think we can, simply by observing how different political approaches organize decision-making authority according to the same levels of moral function. We can even rely on the same ownership categorizations and holistic value calculations, substituting the control of property with the control of "decision-making authority," then include holistic value in that process just as we did for property valuation and exchange. And thus we arrive at the most intimate kernel of the individual freedom vs. collective responsibility dynamic. In more advanced and sophisticated orientations, moral creativity equates the two. That is the political expression of the unitive principle: as our morality evolves, any intention, decision, action or social structure that facilitates individual freedom is increasingly enabled through collective responsibility, and any intention, decision, action or social structure that establishes collective responsibility is grounded in a profound appreciation individual freedom and its routine reification. Thus, in the unitive frame, individual freedom is always a collective responsibility. This equation is evident in the transition from childhood to adulthood in virtually all cultures. Why do we sacrifice some small portion of personal freedom when we enter a committed romantic relationship? Out of love for our partner. Why do we sacrifice a bit more latitude in available choices when we have children? Out of love for our children. Why do we agree to sacrifice a weekend to help a friend who is ill, or relocating, or getting married? Because we love our friends. And why do we, if we are indeed morally mature, sacrifice a handful of additional options in our personal actions when we conform to society's rule of law? Because we love our fellow citizens. An immature person might do all of these things out of fear of abandonment or rejection, or out of a mistrustful attempt to gain advantage, or out of a guilt-ridden sense of obligation, or because they are afraid of being punished for disobeying the law. But a mature person is grounded in affectionate compassion for an ever-enlarging sphere of interconnected awareness, and thus their heart grows to include more and more beyond the tiny, egoic self. It is the tiny, egoic self, after all, that conceives of freedom as being able to do anything we want, without regard to the impact of our actions on the world around us. This leads us to a more comprehensive view of why Aristotle is convinced that a virtuous person acts for their friend's sake, and sacrifices their own interest...even if no one knows about it. As previously alluded to, the breadth of moral creativity guided by such an assumption extends far beyond a few legalistic dos and don'ts, and into a high plane of insightful wisdom about how best to love and serve our fellow human beings. The aim of a morally mature society is to establish a world in which loving, nourishing, enriching actions are supported and augmented through collective agreement, by all and for all. It is a society in which "just, humble, kind, generous, judicious, self-controlled acts that benefit of others without expectation of reciprocation or reward" are the tacitly understood and explicitly celebrated aim. It is the fundamental, unshakeable belief that all human beings can pass through a self-absorbed childhood into an empowered, capable, caring adulthood where agape becomes a natural reflex. And it is the appreciation that humanity is passing through a vast ocean of transformation for a reason - even if that reason is only a process of growing up as individuals, as a cohesive society, as a proud species of planet Earth, or as a contributive consciousness to the Universe itself.